It was still a rainy day. Not heavy but drizzling. They came to our hotel. We met up with Kathy, my wife’s friend who lives in Hong Kong, and her 5-year old son, Adrian. Kathy has settled down in Hong Kong with her husband and they started a family here. Her husband was working that day and could only join us for dinner later. We went to Ocean Park. To go to Ocean Park, you have to go to Admiralty MTR station and take Bus 629 which takes you straight to the sea animal based theme park. Before we did that, we stopped at one of the dim sum restaurants in Admiralty for breakfast. TIP: If you want to avoid long queue at the entrance, it is advisable to purchase your Ocean Park tickets at the Admiralty bus stop. We did just that. The prices are the same. Adult – $250, child (3-11) $125. It took about 25 minutes for the bus to reach Ocean Park. I was amazed with the size of the park. It is huge and consists of two sections – one in valley and another on a hill. The two parts are connected by cable cars. First thing you must do when you are in Ocean Park is to get a timetable for the shows and arrange your time so that you can catch almost all performances. What you must not miss is the main show at Ocean Theatre. Since Kathy had annual passes, we had the privilege to access its VIP seats. The best seats in the house. 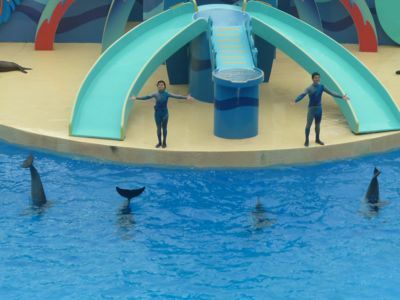 The show was interesting and educational as the storyline was aimed at teaching people to love and appreciate animals. You can see how humans, dolphins, and sea lions interact and live with each other. Later we walked around the park and for the first time in my life I saw live pandas. We also took the cable cars to reach the other side of the park (located on a higher ground and it is where all the rides are located). It is recommended to take the cable car ride as the view is spectacular. What I like most about the park is the display of sea jellyfish. 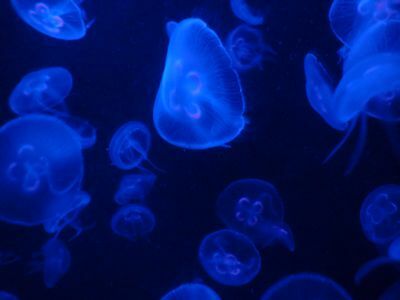 The color of the jellyfish changes according to the color of the lights. We really couldn’t finish the whole theme park. We left the park at about 5.30pm by catching a bus back to Admiralty. This article is part of Family Vacation to Hong Kong series.